There are two kinds of talk pages, or discussion pages, at ShoutWiki: user talk pages, and article talk pages. They exist for communicating with other ShoutWiki users, especially about articles and improving a wiki. There is a talk page attached to every other type of ShoutWiki page; just click the "discussion" or "talk page" link at the top of any page to find it. This link will be red while the page is empty; a blue link means that there is some conversation happening on the page. What are user talk pages? 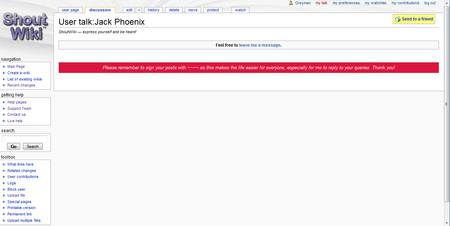 A screen shot of Jack Phoenix's talk page, as seen on 7 April 2009. Registered contributors have a personal talk page where other users can leave messages. Just click the "discussion/talk page" link at the top of a user page. If someone leaves a new message on your talk page, you will see a bright banner across the top of all other ShoutWiki pages you visit. Click the link in the message (or the userbar link "My talk") to go to your talk page. There are talk pages for non-logged-in contributors too, but these may not always be useful. Because they are linked to IPs, and IPs can change between visits, the messages may not get to the right person. While they are used to try to explain blocking of an IP address and may identify where a user is, they may not be very useful for real communication. This is another good reason to create an account. What are article talk pages? Each page in every namespace has its own talk page which can be used to discuss the contents of the article/policy/help page/etc. Leaving a message here does not create a "new messages" banner in the same way user talk pages do, but anyone with an interest in the page -- especially those who see the page on their watchlist or on recent changes -- may reply. Comments on talk pages can be picked up by Google and other search engines, and are available under GFDL, so keep that in mind when you write. It's possible to add a new section to a talk page without opening the whole edit page. Just click the "Leave message" or "+" link at the top of the article. You will be given spaces to enter a title for your new section, and to enter your comment. You can then save, and the comment will be added as a new section at the bottom of the page. This makes it useful for really large discussion pages. If any talk page gets too long, you can create an archive by typing [[/Archive]] (or any other name you like to use) onto the talk page. You can click the new link (preferably in a new window), and copy over the older comments then delete them from the current page when they are saved.